in TSPSC Municipalities Recruitment Exam 2018. Applications for this Health Assistant jobs in Telangana Municipalities will be accepted through online only. TSPSC Telangana Public Service Commission online application available at TSPSC.gov.in from 03-07-2018 to 22-08-2018. Selection for TSPSC Health Assistant Jobs in Municipalities of Telangana State will be through online exam interview. 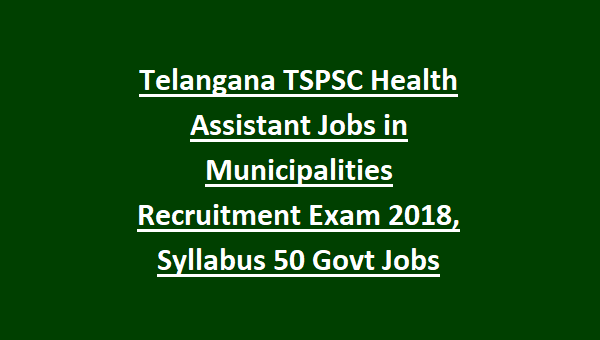 Candidates who are qualified B.Sc Biological Science degree and must of Certification of Multi Purpose Training Course or Sanitary Inspector course they are eligible to apply for Health Assistant Jobs in Municipal Administration of Telangana State TSPSC Recruitment 2018. TSPSC Health Assistant Jobs Recruitment 2018 category wise vacancy details, online application form procedure, selection process, exam syllabus, exam pattern, application fee and more information is given below. 03-08-2018 is the Starting date for TSPSC HA online application. Exam Date (Online Test), Admit Card available dates will be announced later. 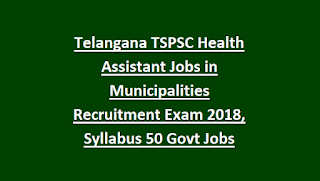 There are total 50 Health Assistant vacancies in this Telangana PSC Municipalities Jobs Recruitment. Refer TSPSC Municipalities notification for Category wise vacancy details. Candidate should have passed B.Sc Biological Science and must have Multi Purpose Health Assistant or Sanitary Inspector certificate . Exam Fee is Rs.80/- and application fee is Rs.200/- for general and for BC, SC,ST and PH candidates there is no exam fee but they have to pay Application fee. Selection for these Municipalities Health Assistant vacancies will be through Online Computer Based Tests only. Online CBT test will be conducted for 150 marks. Submit application form online only for this TSPSC Municipalities Recruitment of Health Assistant posts. Last date to apply online for this TSPSC Health Assistant jobs is 22-08-2018. Official website to apply online is www.tspsc.gov.in. Exam Pattern, Exam Syllabus, admit card released dates, exam result and application form related information for this Municipalities Health Assistant jobs in this website only.